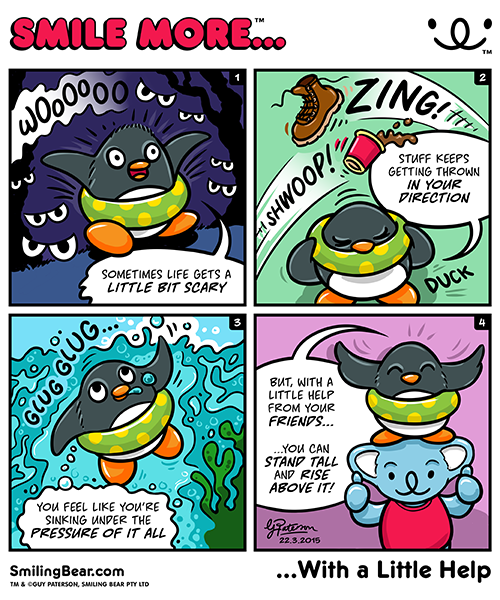 Smiling Bear is running a koala soft toy giveaway competition this month, in Just Kidding magazine. We’re giving away 6 sets of koala soft toys. Cute, adorable Australian koala plush that will be sure to make you Smile More. 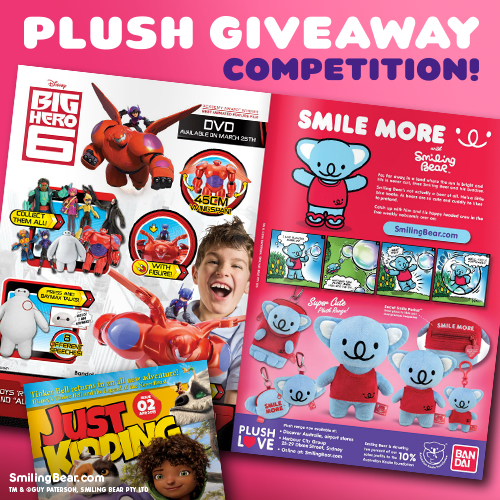 There’s 6 koala plush prize packs to win, so good luck! If you’re far too impatient to wait until the winners are announced, then head over to our online store now! 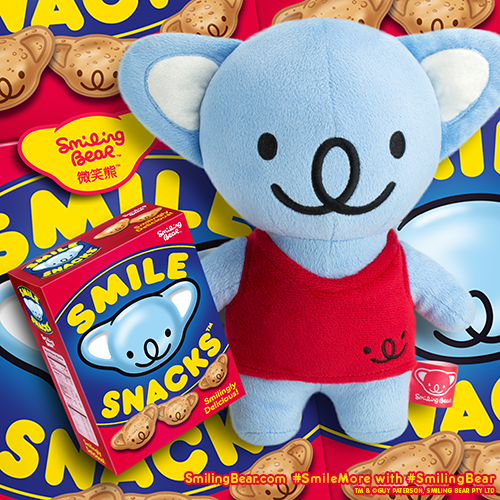 Smiling Bear’s koala cookies, Smile Snacks™ are coming soon to a store near you! Aussie koala shaped, these koala biscuits are the best. You won’t find koala snacks like these anywhere else in the world. Using our secret smile recipe and made using the latest in koala baking technology, these cookies are full of furry goodness. The most delicious, happiest of heads you’ll ever have the pleasure to bite off! Australian cookies with a difference – move over Timtam, it’s time to Smile More with Smile Snacks™ from Smiling Bear. More product information to follow shortly. What Will You Put In Your Secret Smile Pocket? 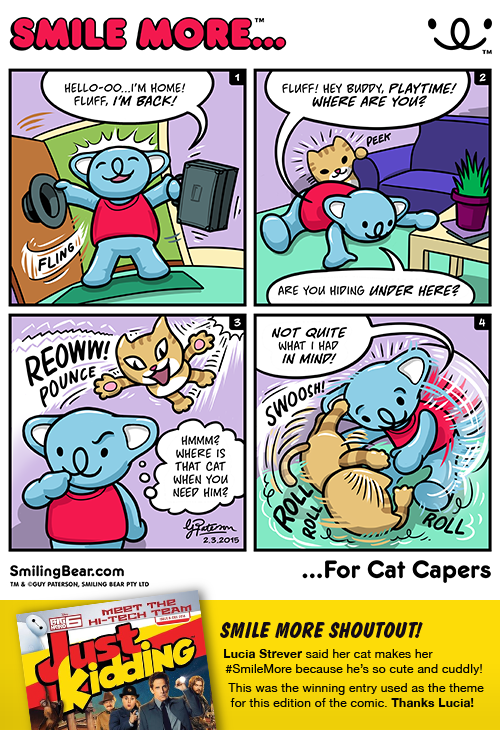 Everyone needs a safe place to hide things away, and Smiling Bear® koala plush is just that perfect, portable place! 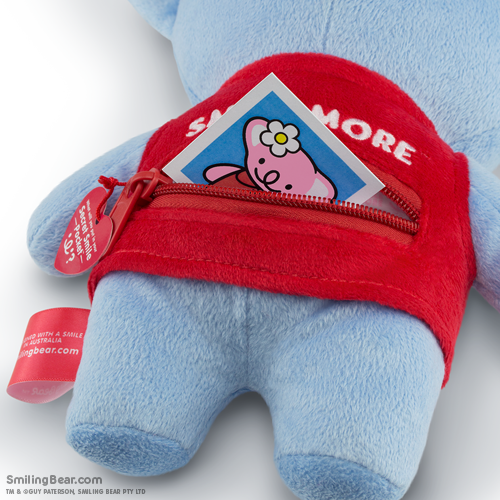 Our 7 inch and 10 inch koala plush have a Secret Smile Pocket™ on the reverse. This pocket is a special, secret place for you to keep your most precious keepsakes safely hidden. A reminder of a great time you had, a special memory. The photo of a loved one, a sweet note or perhaps even the key to someone's heart? The possibilities are endless, so what will you put in your Secret Smile Pocket™? The back of our koala plushies also has the phrase ‘Smile More’ embroidered on it, to remind you to always look for the positive things in life. Each pocket is lined with our signature 'Smile More' patterned lining. 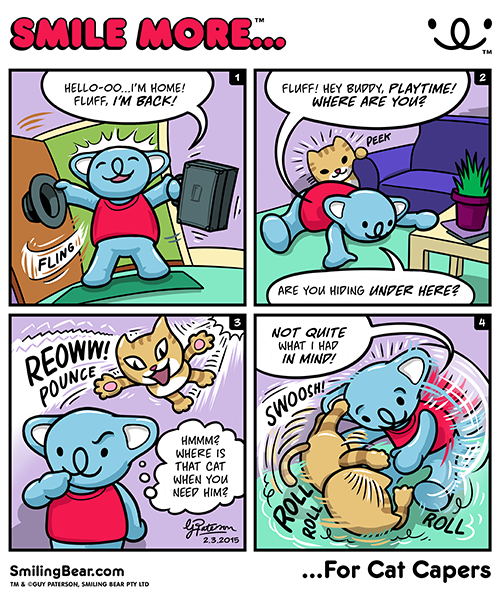 So what are you waiting for…pop on over to our online store here and pick yourself up a koala plush complete with Secret Smile Pocket™ – and start hiding things! 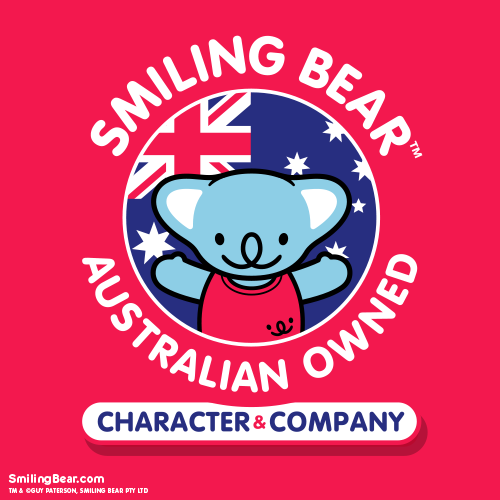 Smiling Bear is an Australian owned company and koala character. The character was dreamt up on the Northern Beaches of Sydney, Australia. As Smiling Bear is actually a koala, (koalas are often mistaken for bears) we will be supporting the Australian Koala Foundation (AKF) by donating 10% of our sales profits and helping to raise global awareness for the koala and it’s protection. So whether you’re an Aussie or a not, take a look at our new koala plush range in our online store here. Smile More and Save the Koala. For more information about the threat to koalas in the wild and how you can help out directly, please visit the AKF site here. Aussie Valentines Day is much the same as it is anywhere else in the world. That mad last minute panic deciding who your koala valentine will be, what to buy them and more importantly, how much to spend! Flowers are always a strong choice, vibrant colors, uplifting fragrance, beautiful arrangements. 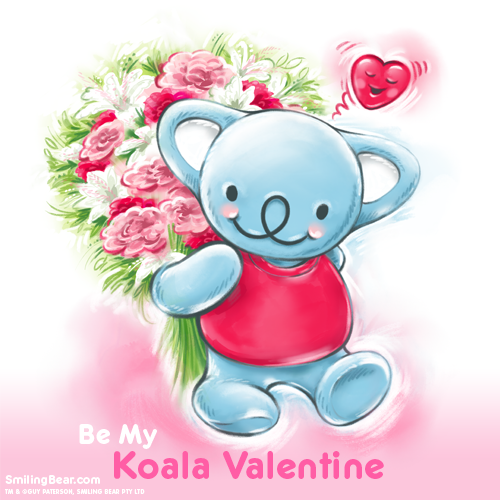 Here’s a cute koala Australian valentines ecard for you to share with the ones you love. Just use the 'Share Some Smile' panel beneath the image, and you can share it to a Facebook timeline, Tweet it, email it and much more. Koala soft toys by Smiling Bear make the perfect Australian gift. Our new koala plush range is iconic and completely unique. These plushies are of the highest quality, and there just isn’t anything else like them currently, in the Australian toy and gift market. If you are looking for something a little bit different, then you’ve come to the right place! 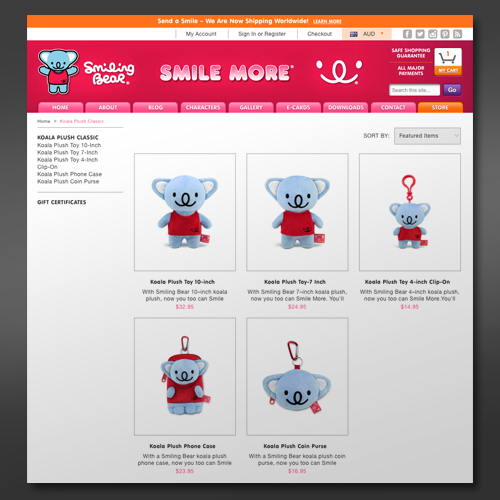 We are very excited to announce the launch of the Smiling Bear online store for all our official character merchandise. You can now purchase the new koala plushies, from our ‘Classic’ product range. With our offer of international shipping, now you too can purchase a little piece of the Aussie lifestyle, no matter where you live. Now it’s your turn to Smile More with Smiling Bear, and pass on this message to those around you. 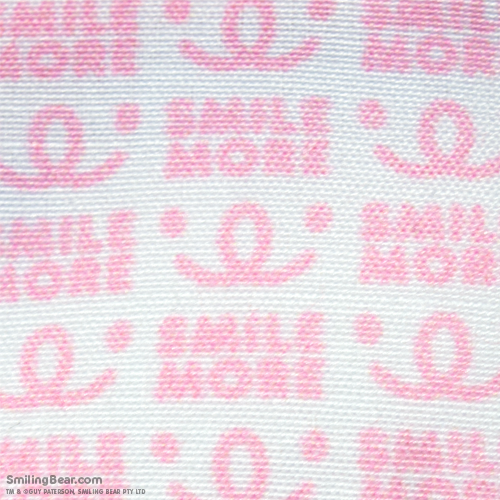 Each product has the Smile More message clearly embroidered on it, reminding you to always look for the positive in things. As an Australian owned character and company, Smiling Bear will also be supporting the Australian Koala Foundation (the AKF) by donating 10% of their sales profits and helping to raise global awareness for the koala and its protection. In the Classic product range, there are three standing pose Smiling Bear koala plush, a 10-inch, 7-inch and a 4-inch clip-on for backpacks. There’s also a very striking plush phone & camera case and a coin purse, and both come with funky red metal carabiner clips to attach to bags or keychains. Head over to the online store now and take a look. There’s loads more information and tons of gorgeous product images to help you choose which products you’d like. Or why not collect them all? 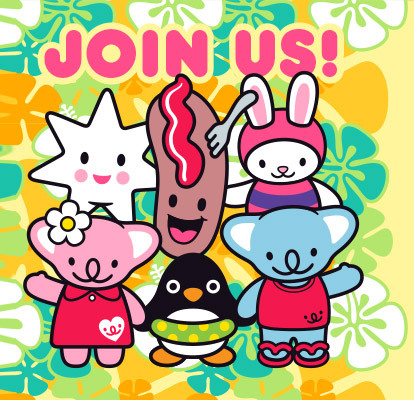 It’s a great way to start your Smiling Bear official merchandise collection! With international shipping and worldwide delivery, we can send you a smile no matter you are in the world. We also accept all major credit cards and Paypal. Our online shopping environment is totally secure so you can shop with us knowing that your details are 100% safe. For all other shopping related questions, please take a look at our Customer Service section of the store. Products Recommended Age: 3 years and above — products are fully safety tested against all the necessary international standards. 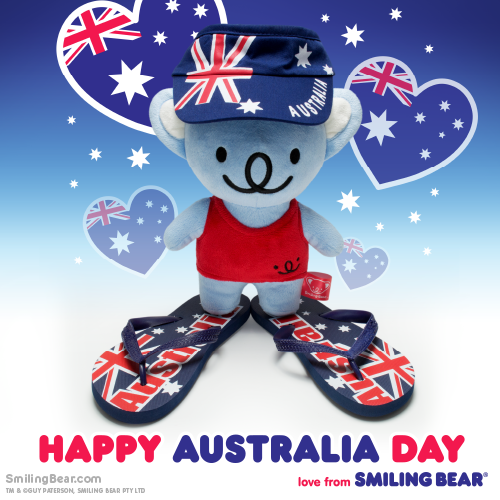 This cute koala would like to wish everyone a Happy Australia Day! We hope you have a fantastic time with your loved ones today. Have fun and be safe, eat lots of great tucker and enjoy your day off. Australia Day, or Straya Day as it’s becoming known more recently, is a huge celebration of this great country we live in! It’s all about having a day off to have fun with family, friends (and lots of food). It’s one day a year to take pride in Australian culture, heritage and history and to inspire our national spirit. It’s also a big day for koala bears, especially Smiling Bear. He likes to put on his best Australia day clothing, all emblazoned with the Australia flag, grab a cold one (ginger beer that is!) and head out to see what everyone is up to. Being an Australian icon, I get a lot of requests for koala cuddling, but of course I don't mind. It’s all part of being in my exclusive club, the Australian koala bears club, we're cute, kawaii and adorable. If you want to find out more about my cute koala plushies, see the link at the bottom of this post. Aussie Day is the official national day of Australia and is celebrated annually on the 26th January. It marks the anniversary of the first fleet of ships arriving at Port Jackson in 1788. However, because of the negative connotations of British settlement upon indigenous Australians (known as Aboriginals) the day is now more about looking towards the future, whilst recognising cultural diversity. So, in modern times the celebrations are about community, being accepting of one another with lots of family friendly events. There are also official award ceremonies like the Australian of the Year award (hello, where’s Smiling Bear’s?!) Young Australian of the Year (again, what about moi?! ), Senior Australian of the Year (ok, I’m obviously too young and beautiful for this) and Australia’s Local Hero (I suppose I’m more of an international super hero). The announcement of the Australia Day Honours list is a big thing, and there’s a speech from the Governor General and Prime Minister, and of course there is the welcoming Australian Citizenship ceremonies for new immigrants into Australia. What Can I do on Australia Day? There are so many great things to do, from going to outdoor concerts, big firework displays, sporting competitions, festivals, street parties, barbecues – the options are endless! If you are looking for things to do you should take a look at the official Australia Day website here, where you can find all local events for your area. It’s also a good place to see lots of messages shared by people from all over Australia, and to see their happy Australia Day images and what they are getting up to. You will be able to find lots of things for an Australia Day for kids, as it’s such a family friendly day where everybody comes together and celebrates. Whether you’re old or young, black or white (or anything in-between) it makes no difference. The day is all about celebrating together, our multiculturalism and unity. Sydney Australia Day celebration is recognised as the nation’s largest celebration, and once again after New Years, the harbour becomes a focus with the world famous ferry race and tall ships race. Each city or central location has its annual traditions too, with Perth Skyworks being the largest single event presentation of the day. 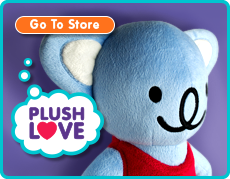 If you want to check out the cute koala plush toy 10–inch shown in the image above, then visit the Smiling Bear store. You can also search the site for previous Australia Day posts to find more images, cards and designs to share with your mates.